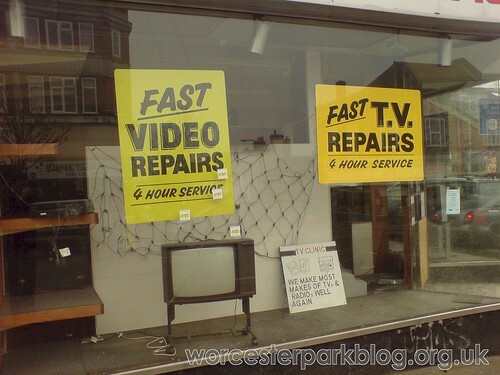 If there were to be a competition to judge Worcester Park's best vacant shop unit (I think I might organise one just so I can call it 'Shop Idle') I would be hard pressed to choose between the old TV Clinic and the empty Drury & Cole shop. I suppose Drury & Cole might just have the edge with its shop that time forgot' look complete with period telephone and armchair (which seems very subtly to move itself around the shop floor). The TV Clinic would be a close second though, saddening us for years with its parade of unclaimed and abandoned TV's and videos languishing mournfully on its shelves. The empty clinic, however, is set to be empty no more with plans submitted to transform the unit into a dental surgery, with two surgery rooms. The application has been submitted by Dr Arrif Lalani, the man behind 'Smile Dental Implants' in Church Hill road Cheam (it's not clear whether the clinic is relocating or opening a second branch). So the Worcester Park's second best unit will shortly be vacant no more. That's surely a reason so smile?